Each snapshot of a virtual machine in VMware creates files. You can consolidate these files when they’re no longer needed. This can let you save space and improve the performance of virtual machines (not to mention operations like moving virtual machines through the vMotion or manually). Consolidating snapshots is also a typical troubleshooting step for a number of problems you can encounter in ESX. The Consolidation command searches for delta data to combine and reorganizes so as not to corrupt any necessary dependencies. When a virtual machine needs to be consolidated, you can see this in the vSphere client under the Summary tab; however, in my experience it doesn’t always think I need to consolidate when I think I do. 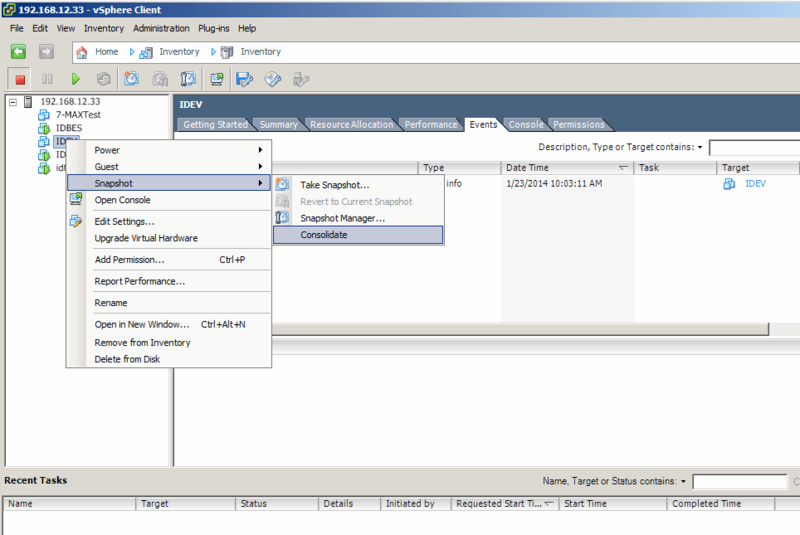 To consolidate, first open the vSphere Client. Once open, right click on a virtual machine and select the Snapshot option in the drop-down list. Then click on Consolidate in the slide out menu and the process will begin.